It's official: the long-rumoured, oft-hinted, city scene has finally started to take shape. 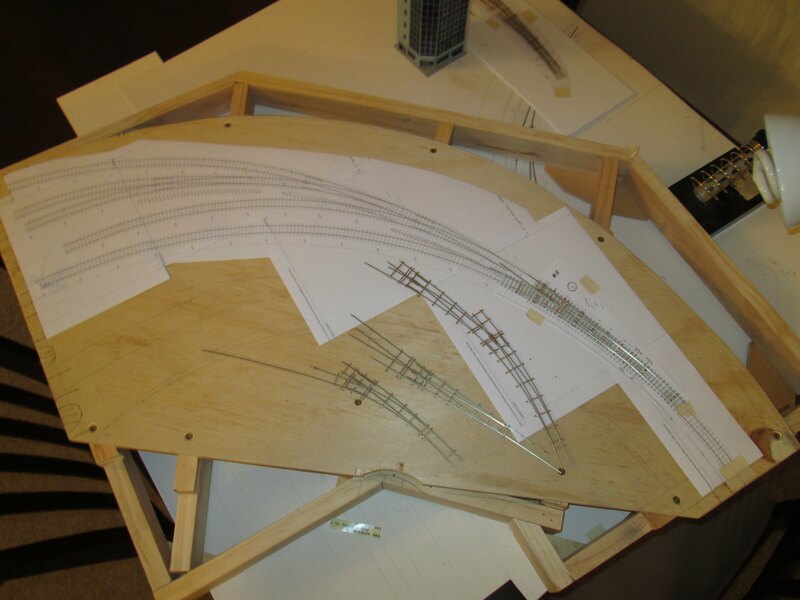 The Utrainian Workshops have been busy churning out points for the complicated yard ladder trackwork; that is, the tracks that will route trains from two main lines onto one of eight platform lines. To further complicate matters, the station trackwork is all located on a curve to maximise the available space for the station platforms. 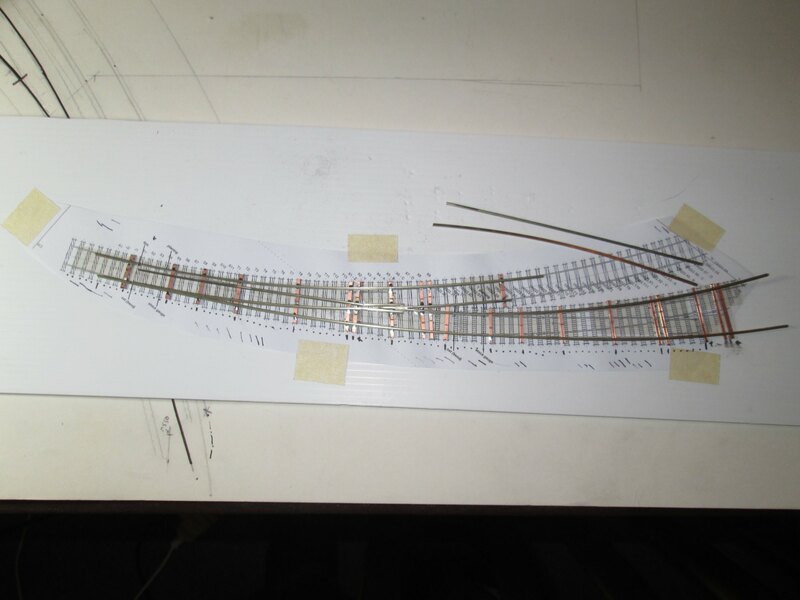 For the first set of points, I drew out the plan full size and used pieces of flexi-track and a length of metal to trace out the curves and track centrelines. I then traced these onto other bits of paper and painstakingly built up the points over these rough outlines. 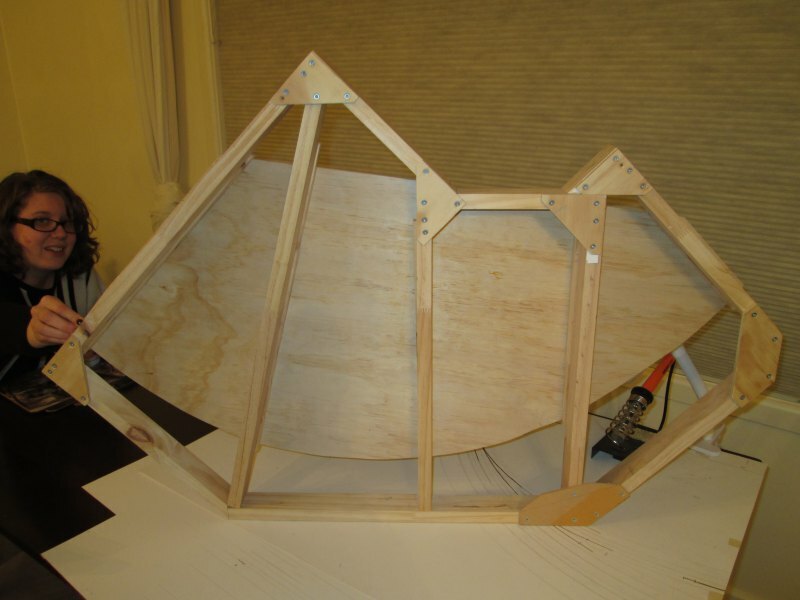 It mostly went well, but there was a lot of fine-tuning required around the frog area; often the wheels would not track very smoothly though the frog area and the wheel flanges would hit one of the point blades, leading to an annoying jiggle as they went through. Not a huge deal, but good if it could be avoided. 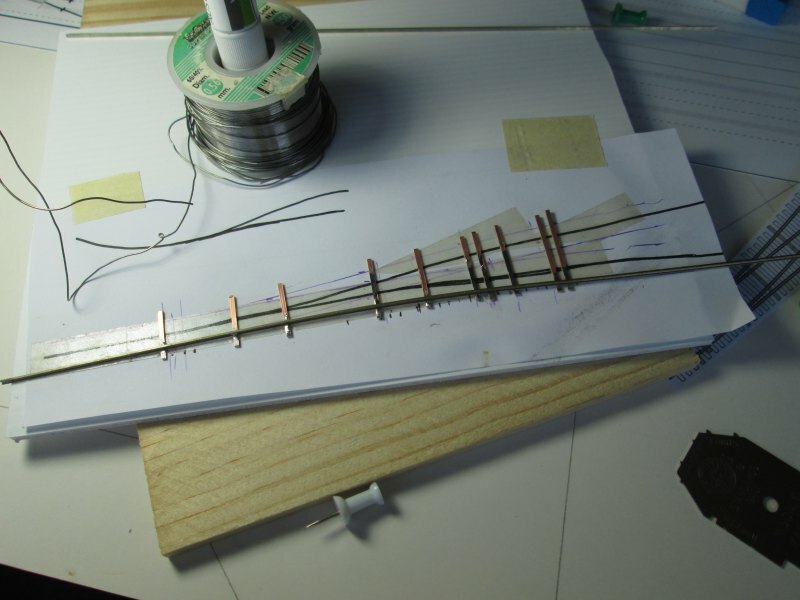 The most complicated of these points was a continuous piece of track with two points flowing into each other; this one took a lot of fiddling and even after tweaking it all evening it still wasn't behaving right. The next morning I sat down and went over the basics to try and work out how it should be working. It would really have helped if I had a template, however the available templates tend to be for simple geometries, not trying-to-squash-in-as-much-as-possible-geometries. 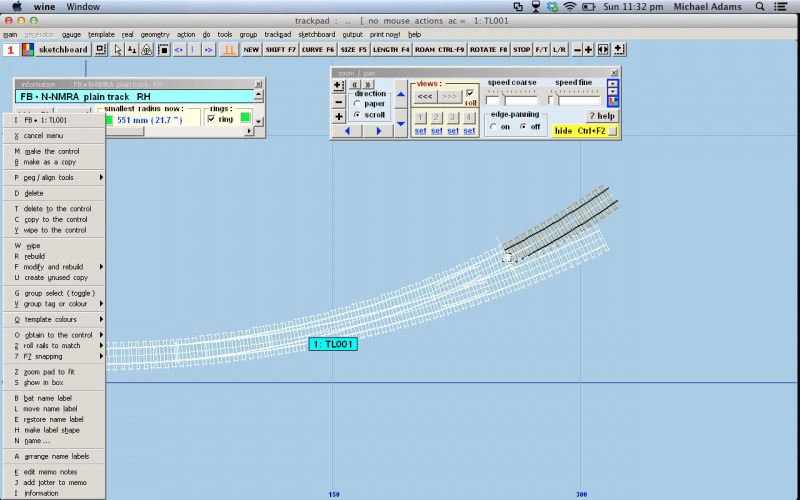 However while hunting I found a program called Templot, which is a totally hideous program with a nightmarish learning curve that produces beautiful track templates. So I spent an evening designing the other set of points and then an even longer period working out how to get it print them out. In the end it was under the Template > Print setup > Page origins > Set page origins menu item, or something along those lines. It's an amazing program where every single function can be done 9 different ways, and every keyboard letter does something different; often I resorted to pressing all the keys till I found the one I wanted! But with a beautiful flowing track plan designed and printed, I stuck all the sheets together and had a perfectly sized track plan and a template for each set of points. Perfect! 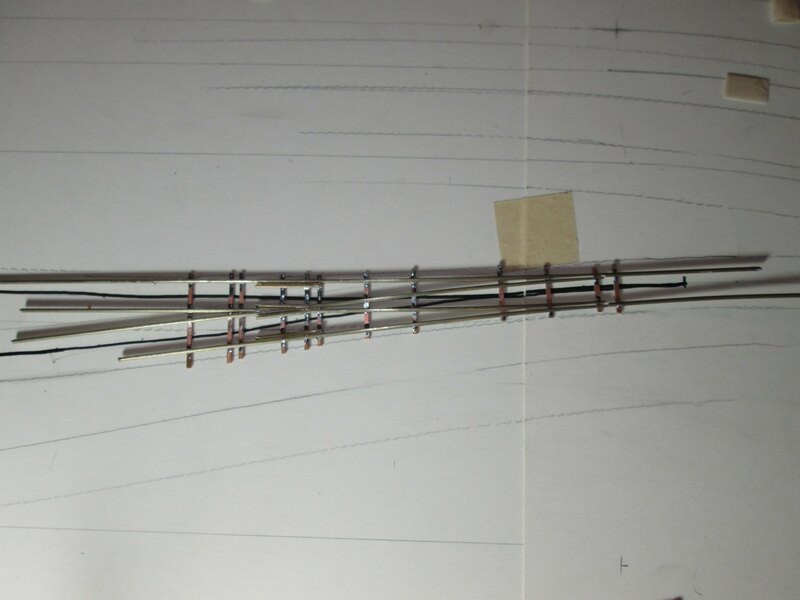 And on the top half, we can see my track plan in position, with the first of the Templotted points, and my freehanded ones below that. No city is complete without some buildings, so to kick start things I placed an order a while ago with Plaza Japan on eBay for 1x small city. When I got home on Saturday there were two large boxes waiting for me from Toru, with all sorts of little buildings inside. Here is one of them, a Kato "6 floor department building (blue)". 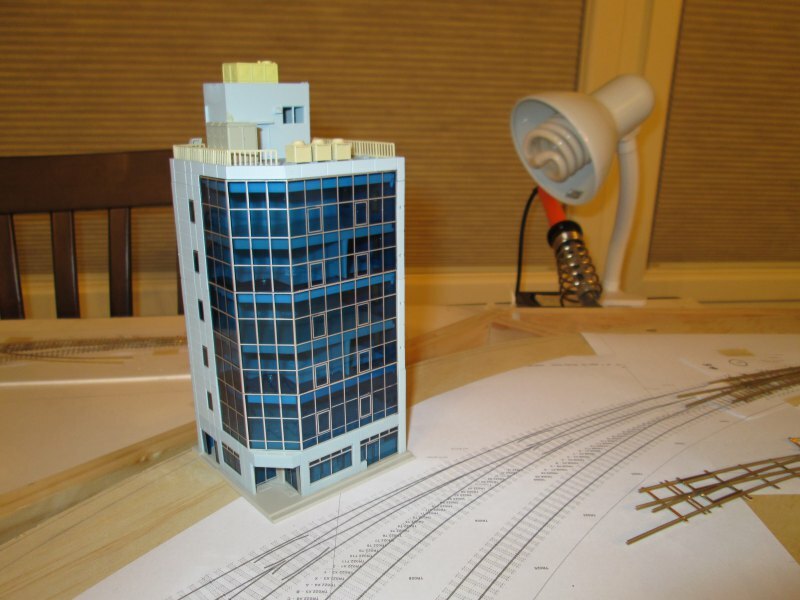 Quite a cool looking building that'll no doubt house a number of the better Utrainia model shops. Although a little hard to see, here is the second and third of the Templot points. This one has so far gone together very quickly and smoothly, with zero fiddling required so far. I may well end up using Templot to redesign the other side of the track, since it does such a good job. Once these are finished I'll begin the exciting task of filling in the gaps with wooden sleepers; maybe that'll be a job for Rachel?! 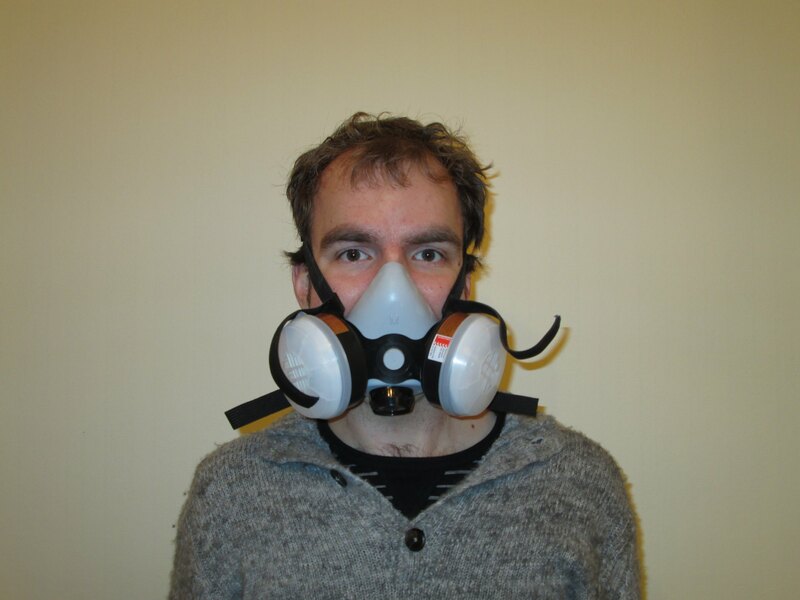 It has fume filters, and will of course filter out dust and other particles etc. It feels a bit weird to wear at first, but it's very nice not having to worry about what I'm breathing in. I cut some fibreglass PCB material on the Dremel and didn't smell a thing, which is great, as fibreglass dust is pretty nasty stuff. That's all for this weekend, hopefully throughout the week I can get more of the trackwork done. I'm looking forward to detailing some of the buildings, adding tenants and lighting.